Italy has chosen a culinary staple - classic Neapolitan pizza with tomato, basil and mozzarella commonly known as pizza margherita - as its number one candidate for protection under UNESCO's Intangible Cultural Heritage list, local media report. Neapolitan pizza already boasts special status, granted to it by EU law back in 2009. A committee in Brussels officially listed the ingredients from which it must be made in order to be regarded as authentic. Imitations are limitless, but the real pizza Napoletana measures up to 35cm in diameter and has a slightly-elevated rim of no more than 2cm. The base should be cooked for between 60 and 90 seconds in a stone oven with an oak-wood fire. A bill tabled in the Italian parliament in 2004 specified which types of flour, yeast, salt and tomatoes - sourced from Naples - must be used in pizza Margherita. It also determined that the dough has to be kneaded only by hand. An Italian farmers' association then noted that half of Italy's pizzerias were using foreign ingredients to make one of the world's most popular dishes, including Chinese tomatoes and Tunisian olive oil. This time around the Italian National Commission for UNESCO decided to recognize "the art of Neapolitan pizza makers" - pizzaiolos – as a tribute to their culinary skills. Naples is the city of pizza aficionados. On Tuesday Pope Francis accepted a pizza handed to him by a restaurant owner in the southern Italian city, whilst riding in his Popemobile. The pizza was topped with yellow cherry tomatoes and buffalo mozzarella, in reference to the Vatican flag, read "W il Papa" (Long live the Pope). 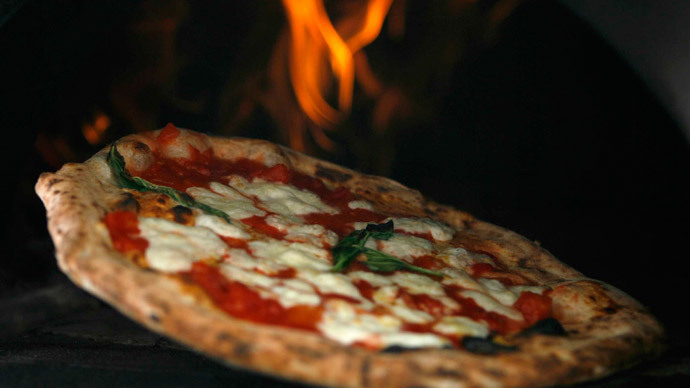 The Neapolitan pizza was invented between 1715 and 1725, with Margherita first cooked up in 1889. According to legend, the Margherita pizza, whose red tomatoes, green basil and white mozzarella represent the Italian flag, was named after Queen Margherita of Savoy.